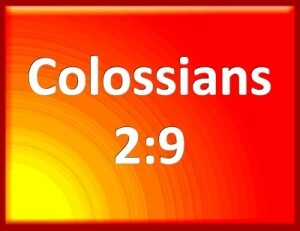 “ For in him [Christ] dwelleth all the fulness of the Godhead bodily.” (Colossians 2:9) In Christ dwells all the fullness of the Godhead. Notice Colossians 1:19. “For it pleased the Father that in him should all fulness dwell.” (Colossians 1:19) God the Father was pleased to have His Son filled with all the fulness of the Godhead. How did this take place? “For he whom God hath sent speaketh the words of God: for God giveth not the Spirit by measure unto him.” (John 3:34) God gave His Spirit to His Son without measure. Jesus was filled with all the fullness of God. Does Colossians 2:9 say that Christ is the Godhead? No, it says that Christ was filled with all the fullness of the Godhead. How? “To wit, that God was in Christ, reconciling the world unto himself, not imputing their trespasses unto them; and hath committed unto us the word of reconciliation.” (2 Corinthians 5:19) God the Father was in His Son, filling Him with all the fullness of the Godhead. The word Godhead is used three times in the Bible. Here is the first time it is used, “Forasmuch then as we are the offspring of God, we ought not to think that the Godhead is like unto gold, or silver, or stone, graven by art and man’s device.” (Acts 17:29) We are the offspring of the Godhead. “For ye are all the children of God by faith in Christ Jesus.” (Galatians 3:26) Who is the Godhead? 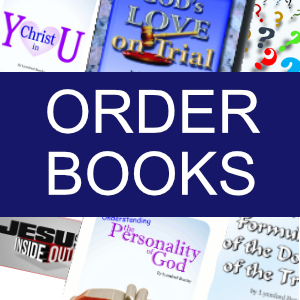 “But I would have you know, that the head of every man is Christ; and the head of the woman is the man; and the head of Christ is God.” (1 Corinthians 11:3) The ultimate Godhead is God the Father, who is head over all.